In this ISDP Forum, Marvi Memon, former Federal Minister and Chairperson of the Benazir Income Support Program (BISP), will deliver a presentation on CPEC and its political and social impact on Pakistan. 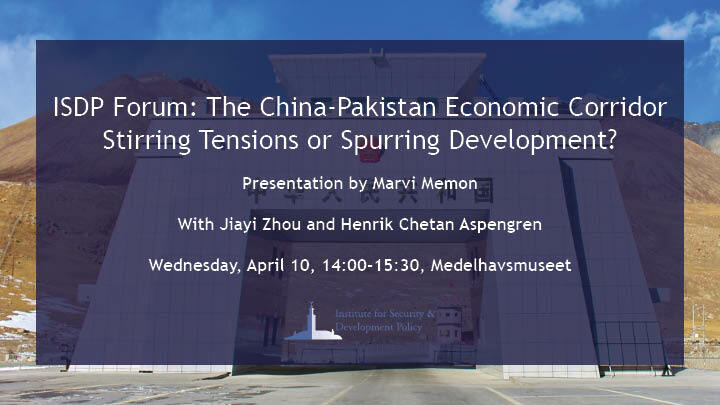 Henrik Chetan Aspengren, Research Fellow at the Swedish Institute of International Affairs, and Jiayi Zhou, Researcher at the Stockholm International Peace Research Institute, will give remarks on Ms Memon’s presentation. The presentation will be followed by a panel discussion and Q&A session with the audience. Marvi Memon is a humanitarian, former parliamentarian, cabinet member, and former CEO. She graduated from the London School of Economics and Political Science with a B.Sc (Econ.) Honors in International Relations in 1993. She has since worked for Citibank, been CEO of Pakistan’s first satellite tracking company, advised the President of Pakistan on Media Management, served at the Ministry of Investments and been a parliamentarian for two consecutive terms serving as Chairperson of Parliament’s Information Committee. She was most recently a Federal Minister in charge of the largest social safety net of Pakistan, BISP, and is currently on a lecture tour of Europe. Ms. Memon was the inaugural awardee of the UK House of Commons Speaker’s Democracy Award 2017, received the French National Order of Merit in 2017 and is a Member of the World Bank Advisory Council on Gender and Development.